Hi, thanks for having me. My name is Marc Austin, I am a Build Supervisor at DNEG Vancouver. I’ve been with DNEG for 7 years now, starting as a CG Generalist and working my way up to Build Supervisor. Most recently I’ve been working on Alita: Battle Angel and Pacific Rim: Uprising. DNEG is one of the world’s leading visual effects, animation and stereo conversion companies for feature film and television, with studios in London, Vancouver, Mumbai, Los Angeles, Chennai, Montréal, Chandigarh, Hyderabad, and Goa. I started to use Substance Designer on Assassin’s Creed (2016 film) to make the Animus. This was a great chance to test out the software in a production environment. The addition of Iray to Substance Designer meant I could start to texture and do look development of assets all within one application. This reduced the creative cycle, and the need to bounce between different packages. 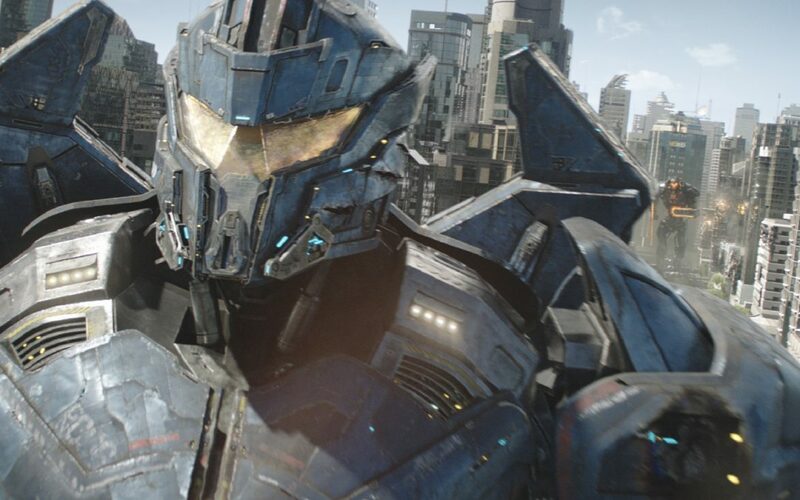 New shots were continuously being designed to sell the scale of the Jaegers. We didn’t want the quality of the assets to dictate how a shot would be realized, so we opted to make the Jaegers hold up to scrutiny from any camera angle, and within a few meters from the surface. The Substance materials were built upon the same common set of data maps and hand-painted maps, allowing us to design a standard set of interchangeable features. Simple hand-painted maps were made in Mari (Substance Painter didn’t support UDIMs at the time) and included masks for decals, panel lines, and substructures. We altered these maps in Substance Designer to create features like decal wear and panel warping. The Jaeger’s surface area was huge, coupled with the need to allow any framing of a Jaeger a shot needed, we ended up with 1000+ UDIMs at 4K. Dealing with this amount of data was the main reason to use Substance Designer. These were the missing building blocks upon which many higher-level tools were built, similar to the filters found in Substance Designer’s library. They were designed to be as generic as possible, allowing them to be used in a wide variety of applications. We designed a set of vector control tools and a new trails tool. With these two core tools, we were able to make realistic drips and erosion which followed over the Jeager’s body. This structured material creation process helped us strategize which tools needed developing and which didn’t, and allowed us to maximize the little time we had. Here is a production graph for a paint material. Inputs were altered and feed into many different features. These features masks were used to alter the main material’s properties and features. Whilst complex, this graph was still readable, allowing new artists to quickly use and update materials. It’s a case of choosing the best tools for the task. Substance Painter best allows this quick responsive surfacing goal and has gained wide adoption at DNEG. We also use the workflow for Pacific Rim: Uprising, where we have very large assets, or where we can iterate in a batch processing way.